CONTEXT: The dorsal cutaneous appendage, or so-called human tail, is often considered to be a cutaneous marker of underlying occult spinal dysraphism. Human tails have always elicited curiosity. A unique case of human dysraphism is described. CASE REPORT: An interesting case of a child with a tail-like caudal appendage that had been present since birth is reported. Surgical excision of a pseudo-tail was done together with repair of a meningocele. CONCLUSION: Before any form of treatment for a caudal appendage is undertaken, the patient must be evaluated carefully in case it coexists with a lesion of the intraspinal component. A human tail is a rare congenital anomaly protruding from the lumbosacrococcygeal region. Some authors have considered this rare and curious condition to be evidence of man's descent from or relation to other animals, while others have made it the subject of superstition. Advanced imaging technology in recent decades has allowed more thorough investigation of these patients and better defined the association of such lesions with spinal dysraphism and tethered spinal cord. Management must include a complete neurological history and examination as well as magnetic resonance imaging or a computed tomography scan. After diagnosis, microsurgery should be performed if there is any intraspinal component, to avoid damage and neurological deficit. A healthy 4-month-old male infant was brought for investigation of a tail-like structure that had been present in the lumbosacral area since birth (Fig. 1). According to the parents, the tail had measured about 3 cm at birth and had been increasing in size. On physical examination, the appendage was tail-like, soft, well circumscribed, 5 cm long and 0.5 cm thick and was attached to the back of the tip of the coccyx, appearing like a human tail. It was soft, non-tender and covered with normal skin. There was no voluntary movement in the tail. The findings on general and systemic examination were otherwise normal. The child had no other congenital defect, and there was no family history of any developmental or congenital anomaly. The possibility of a true neonatal tail as opposed to a pseudotail (see below) was considered. 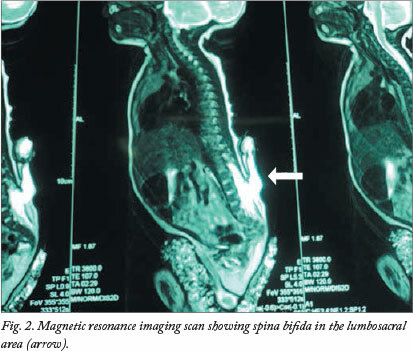 Imaging of the spine showed a spina bifida in the lumbosacral area (Fig. 2). The patient was moved to the neonatal intensive care unit and the neurosurgeon removed the tail and repaired the meningocele. Histopathological examination revealed that the tail-like structure contained skin, muscle and adipose tissue only. The infant recovered uneventfully and no neurological deficit was evident on follow-up until 12 months of age. Caudal appendages are unusual malformations and are divided into true tails and pseudo-tails (lipoma, teratoma, myelomeningocele and parasitic fetus). In contrast, like other lumbosacral skin lesions, the caudal appendages mostly occurring with spina biida occulta or spinal dysraphism are pseudo-tails. The appendage is only a cutaneous marker of the underlying spinal dysraphism, since the skin and nerve systems are related by their similar ectodermal origin, and surgical excision is not done for cosmetic reasons alone. Further pre-operative examination and complex surgical intervention are usually necessary. In conclusion, the caudal appendage is not difficult to treat. However, before the method of treatment is chosen, it is necessary to evaluate the patient carefully in case the appendage coexists with lesions of the intraspinal component. After the operation, long-term follow-up of the patient for tethered cord is necessary.